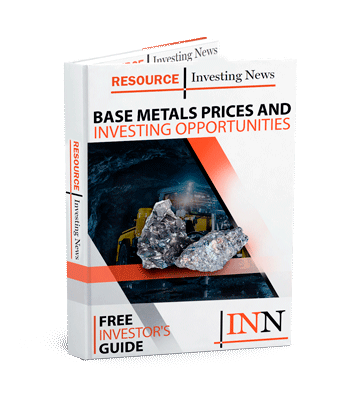 What happened in the base metals space this week? Here’s a round up of the top stories covered by the Investing News Network. Base metals had a positive week, with copper, nickel and zinc prices trading higher and posting monthly gains for February. Copper prices started the week on a high note, trading above the US$6,500-per-tonne mark on Monday (February 25), on the back of optimism about a US-China trade deal. Prices for the red metal were also supported by tight warehouse inventories, which were near record lows during the five-day period. London Metal Exchange stocks are “surprisingly low,” and would usually lead to “incredibly backwardated curves” if the market was so short of metal, said Guy Wolf, head of global market analytics at Marex Spectron. Copper closed at US$6,535 per tonne on Thursday (February 28). Looking over to nickel, prices were also on an uptrend this week, with the metal trading at US$13,030 by Thursday and on track for a second consecutive week of gains. Similarly, zinc enjoyed another good week with prices ending at US$2,793 per tonne on Thursday. The metal, used to galvanize steel, was up almost 2 percent for the week as concerns over a shortage of refined metal have persisted. Copper prices started the week with a leap and bound on the back of optimism from US President Donald Trump regarding reaching a final trade deal with China. The red metal saw its highest price since early July when benchmark prices peaked on the London Metal Exchange at US$6,540 per metric tonne, though they simmered to US$6,480 by close. This comes after copper broke through the US$6,000-per-tonne mark in late January amid a weaker dollar and strengthening sentiment towards the Chinese economy. On January 25 2019, over 300 people were killed when an upstream tailings dam near Brumadinho in Brazil collapsed, releasing 12 million cubic metres of iron-ore mining byproduct that buried nearby mining facilities. Since then, its operator, Vale’s (NYSE:VALE) share price on the New York and Sao Paulo stock exchanges has been well down — and rival companies have been going out of their way to declare their own facilities safe, and their oversight robust. In response, the Agência Nacional de Mineração (ANM) announced that upstream tailings dams — which was the design of the dam that collapsed — are now banned in Brazil. Experts approached by INN said that banning upstream tailings facilities was missing the point when it came to avoiding disasters like Brumadinho and Samarco — with design and oversight the primary concern. Mining giant Rio Tinto (ASX:RIO,LSE:RIO,NYSE:RIO) has uncovered copper-gold mineralization at its Winu project in the Yeneena Basin of Western Australia’s Paterson Province. The discovery came through an exploration program being conducted by Rio subsidiary Rio Tinto Exploration. Eight reverse circulation and 20 diamond holes were drilled on one of the company’s exploration licenses between December 2017 and the end of 2018, which totalled 13,286 metres. While the company is still waiting to receive assay results from six remaining diamond holes, results from the other drill holes indicated “relatively wide” intersections of copper mineralization. The intersections are also associated with gold and silver, with vein style copper, gold and silver mineralization beneath shallow cover of 50 to 100 metres. In other base metals news this week, Sherritt International (TSX:S) reported a production milestone at its refinery in Fort Saskatchewan. The refinery has reached three billion pounds of finished nickel production since its operations first began in 1954. Meanwhile in South America, Southern Copper (NYSE:SCCO) received good news last week. According to Reuters, the Peruvian government will likely grant Southern Copper a construction license for its US$1.4-billion Tia Maria project before its environmental permit expires in August. “It’s a project that’s been prioritized by the government so that it can be implemented in 2019,” Energy and Mines Minister Francisco Ismodes said. The mine is forecast to produce 120,000 tonnes of high-grade copper annually. In Chile, the Chuquicamata underground copper mine is estimated to start operations by mid-year, Codelco’s chairman said this week. Codelco announced a US$5.55-billion investment to convert Chuquicamata from an open-cast mine into an underground facility last year. Looking over to Mongolia, Turquoise Hill Resources (NYSE:TRQ,TSX:TRQ) has warned of potential further delays at its Oyu Tolgoi underground mine. The company said that the completion of “technically complex” installations at Shaft 2 could take longer than previously thought. Editor’s note: The video above refers to Vale’s dam collapse at one of its operations in Brazil, causing the deaths of over 300 people. The correct information is 186 people were killed and at least 122 people are still missing.